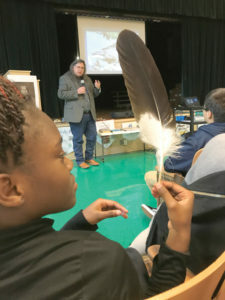 One student is mesmerized by the details in an eagle’s feather. Quanah Parker was the last free Comanche chief in Texas before moving his people to the Indian Reservations in the late 1800s. Tahmahkera, of Burleson, says it is important for him to keep his Comanche culture alive. Tahmahkera says only two percent of Comanches can speak their language fluently. He explained that their language was never written down. Students at Hill had the opportunity to touch many authentic Comanche items including arrows, eagle feathers and Comanche clothing. “I enjoyed the pictures that he showed us and how the Comanches were like back then,” seventh grader Iratze Padron added. Tahmahkera has been speaking to school groups for more than 20 years and plans to continue to visit as many schools as he can. He hopes to return to Hill Middle School again next year.